Furthermore, do you believe that marriage should be entered with the idea that it’s forever? This is the question we posed to our community and it was definitely a hot topic with a whole bunch of different, insightful and some controversial responses! After all, when two people come together they bring with them a whole mix of different backgrounds, values, beliefs, ideas, and challenges. A marriage made a lot of sense once upon a time but in 2019, when traditional gender roles have been re-defined and continue to shift, where does the institution of marriage fit in with our ever-changing society? In this educational and entertaining video from The School of Life, it is stated that “marriage is an inhibitor of impulse.” In other words, it’s a clever way to stop us from sabotaging ourselves and playing the long game when it comes to relationships. When you understand and go into a relationship, and marriage, with eyes wide open instead of doing so blindly, then you’ll be able to work through the inevitable challenges that come up. If you expect it all to be smooth sailing you’re in for a rude awakening! The most important factor for a happy marriage is attention. Small moments of positive attention. According to psychologist Dr. John Gottman, lasting love is the result of little, everyday moments of connection. That’s right: the quality of love in your relationship is determined in the daily grind, not on that all-inclusive cruise around the Bahamas. In this beautiful video by contemporary poet Prince EA, he shares this idea as well as a personal story that illustrates the importance of small moments of positive attention. You are in love with one another. A desire to share your life with another. To have a lifetime companion. You both have realistic expectations and shared goals. You would feel comfortable doing premarital counseling to make certain this is the right choice. You want to feel connected with a person you love and to grow with that person emotionally. Willingness to be there for one another while you each fulfill your own needs and dreams. You both do not have blinders on and have spent enough time together to know it’s the right choice. Whilst we, as a married couple, certainly believe in the benefits of marriage, we’re the first to agree that it takes a heck of a lot of work to have a happy and sustainable relationship. Learning how to better identify and then communicate your wants, needs, fears and frustrations. And the power of committing to working through the financials and developing our communication skills together. You feel too guilty or ashamed to back out when plagued with doubt. You are willing to gamble on your future spouse changing or having potential. Want to be free from parents. To show you are an adult. Just because he or she loves you. To save, rescue or help someone. Because you want a baby. Because all your friends are married. You’ve always wanted a fancy wedding. Or to wear the fancy dress. Out of fear that no one else will want to marry you. You think you are running out of time to get married. To have someone to “complete” you. Someone is pressuring you into getting married. You don’t want people gossiping about the two of you living together. To get health or insurance benefits from the spouse’s employer. As we discuss in this podcast episode, marriage is not for everyone. There are also benefits of NOT jumping into marriage. You know those wrong reasons to marry mentioned earlier? Well, as an unmarried person you can work through all of those things on your own and find support through friends, lovers and other people. 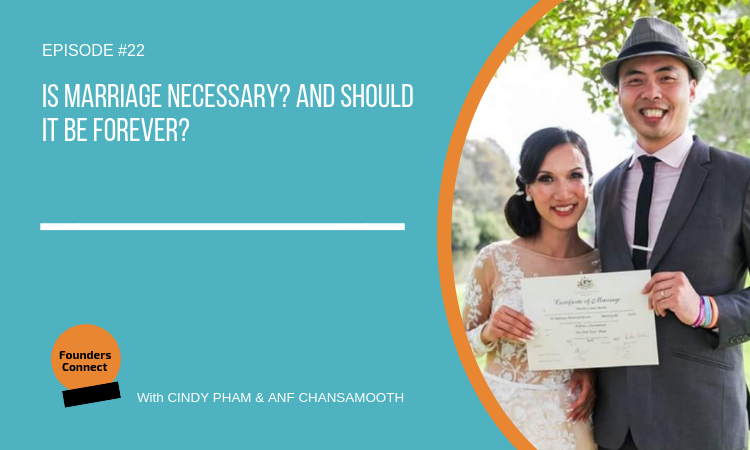 Is Marriage Necessary, and Is It Forever? In this episode, we share some interesting historical facts about marriage as a social contract, as well as some of the responses we received from our community survey. We also share our own individual perspectives on this topic. Get ready for an entertaining, and eye and heart-opening discussion.